Werner's Cairns blog: Fair dinkum, not exactly Oxford English, but Aussie lingo. Fair dinkum, not exactly Oxford English, but Aussie lingo. Below is an interesting explanation how the phrase “fair dinkum” came about. It is interesting to know that it is only used in Australia and New Zealand, yet originated in England. Below you will find an explanation of the origin of “Fair dinkum,” but first my story about the English language. English is not my mother tongue, but my adopted language, and I have become fascinated with it – and that is “fair dinkum.” It has become more or less a hobby for me, and I have accumulated over the years a large vocabulary of English words and I continue to add more to it. The English language stands out in its wealth of vernaculars. But we Australians have our own unique reservoir of vernaculars; phrases, and slang, the latter often not flattering and inappropriate for formal occasions. When I came to Australia in 1954 I volunteered to cut sugar cane and was sent to the Maclean district in northern NSW. I was in a gang of five German migrants and we were given instructions with the help of an interpreter. Then the Cane inspector from the sugar Mill asked, “Who of you speaks English?” I said, kind of reluctantly, that I had completed a correspondence course in English in Germany. “OK,” said the cane inspector, “you are the ganger!” I had to ask what “ganger” meant and entailed, as I had never come across this word in my correspondence course. After it had been explained what my duties were, I was overwhelmed by this sudden promotion. Although I had completed an English correspondence course, I soon realised that there was a big difference between reading the language, understanding what is being said, and speaking it. Conversation between the farmer and me usually went something like this: he would give me instructions and after every sentence I would say, “Yes”. After about four instructions and four yeses, he would ask me, “Do you understand?” To which I would reply, “No”. The exasperation clearly showed on his face, and he would scratch his head mumbling to himself and walking away to organise an interpreter. I wasn’t sure what he mumbled, but I had the feeling it contained some expletives (plus perhaps – “Bloody New Australians”) as migrants were called then. Then I remembered the advice my cousin Paul gave me back in Germany; he had learned English at the University, but had never been in a crash-course situation like me. He gave me the following counsel. "In Germany we speak different dialects, but everybody can also speak the High-German or school German. The same situation exists in England, and I'm sure the same applies in Australia”. (I remembered the language problem I’d had in the canteen in Bremen speaking my dialect). “The equivalent of the school German in the English language is Oxford English", Paul said, “the English you learned in your correspondence course”. With this in mind I faced the next day with additional confidence. During "smoko" time the farmer came along to tell us something, and I was ready to try this new tack. After he finished the first sentence I said, “Would you speak Oxford English please?” For a moment I thought he was going to have convulsions; in order not to swallow his tongue he coughed and his cigarette dropped from between his lips. “Hey? Oxford English? Oxford English?” he slowly repeated again with a perplexed facial expression. “You must be bloody joking, ha, ha, ha”, and finishing with a guttural laugh. Meaning: Honest; genuine; fair play. Origin. 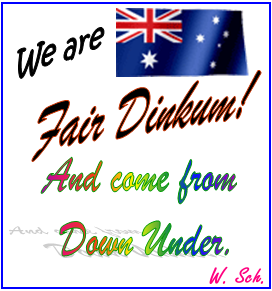 There could hardly be a more Southern Hemisphere expression than 'fair dinkum'. The phrase, which is hardly used outside Australia and New Zealand, conjures up images of horny-handed ranchers with corks on their hats. A 'fair-dinkum Aussie' is indeed what the locals call someone who embodies the nation's values. So, where did the phrase originate? Alice Springs? Auckland? No, Lincolnshire in England. That claim will take a little justifying, especially to readers down under, so here goes. Firstly, let's get out of the way the folk-etymological tale that the phrase derives from the expression 'din gum', used by Chinese miners with the meaning ‘real gold’. My Chinese is less than perfect and I can't comment on whether or not 'real gold' is a correct translation, but I can say that there's no evidence to link the phrase to China. There is, however, a mining connection in the phrase's background. The 'honesty' or 'fair play' meaning is what people now mean by the phrase. The 'fair' was added to dinkum for emphasis, much in the same way that it was added to 'square' to make 'fair and square'. The 'fair play' meaning was known in England from at least 1882, as in this example from a report of a political meeting in Lincoln, reported in the Nottingham Evening Post, February 1882. The paper reports the opinions of Richard Hall, a local magistrate who was complaining about the unfair policies of the Gladstone government, which he believed favoured the wealthy: In all of these things he thought there should be fair 'dinkum' to all classes of people. 'Fair dinkum' also appeared in Australia, in the Sydney newspaper The Bulletin, in 1894. 'Fair dinkum' was used by the colliers of the UK's East Midlands from the 1880s and by Australians from a few years later. In the late 19th century, in addition to the numerous criminals who were transported, many mineworkers migrated from England to Australia, taking their working language with them. Significantly as far as the derivation of this phrase is concerned, the direction of migration was very much one way and few migrants ever came back. To learn more about Australian slang, click here. 1. Australian Slang explained. Click here. 2. More elucidation about our lingo. Click here. 3. A video presentation about our slang. Click here. Here is an interesting poem written by June Courtney from the Gold Coast Australia. June and her late husband migrated to Australia from Ireland after World War Two. Any argument you may have is referred to as a "Blue"
If you are not too well it is said you’re "Feelin’ Crook"
And if complaining all the time you will be called a "Sook"
Since living in Australia I know a Koala’s not a bear.